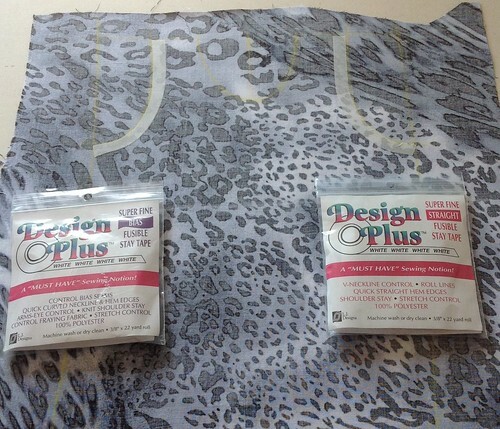 Yesterday, Sandra asked me to clarify how I used fusible tape to minimize the shiftiness of the rayon challis. Now, I don’t know if this is the proper way to do it but it worked for my purposes and I’m happy to share the process. My main issue with the fabric was shiftiness, during cutting and then again when I was pinning pieces together. So I mostly wanted to stabilize the seam allowances. This is a miniature front on a remnant of that challis. (Seriously, it probably wouldn’t fit an infant.) The yellow lines are the cutting lines. This (iron-on) fusible tape is available in white and black, straight and bias. I use whichever works best for the project at hand. Here I used both, to show you the differences. I applied the tape just inside the cutting line. 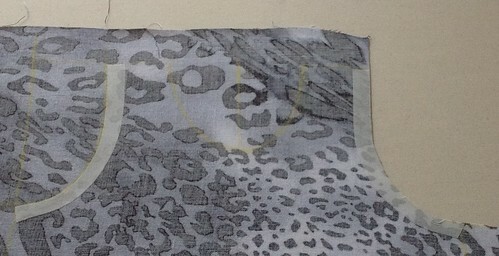 The tape is ⅜” wide and my seam allowances are ¼” so the tape will be caught in the stitching but won’t extend past it very much into the garment. On the left side of the picture is the bias tape – you can see how smoothly it applied and if you look carefully, you can see it got a little bit narrower around the curve, where I stretched it gently as I ironed it on. On the right side of the picture is the straight tape – you can see it never narrows and even though it can handle some gentle curves (mid-armhole), more curved areas may result in tiny folds (lower armhole). This is easier to see if you click on the picture to see a larger version. It is super easy to cut a stabilized edge like that. I cut just inside the marked cutting lines, right next to the tape. No fraying, no shifting. Both tapes have enough stretch in them so the seam allowances lie flat after stitching, at least in an adult-sized garment (fairly gentle curves). With tighter curves, clipping may become necessary. I hope this helps. If anything is unclear, my apologies, just ask in the comments and I’ll do my best to answer more clearly. 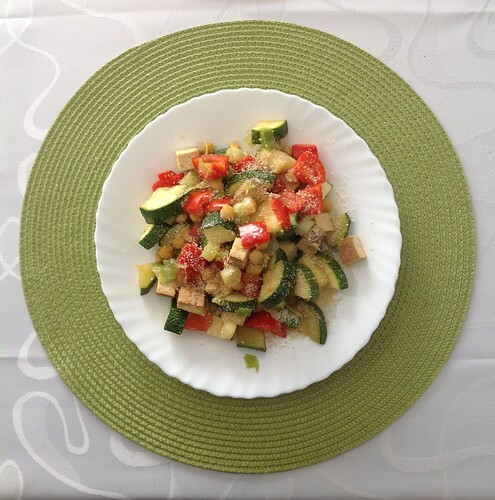 I leave you with a picture of my dinner concoction from last night: leeks, zucchini, red bell pepper, chickpeas, smoked tofu, and curry seasoning. Served with a generous sprinkle of ground sesame seeds.